As long as I’ve been teaching, I’ve held the view that homework makes a massive difference to the learning process. Without any doubt, students who are successful at A level and at GCSE are those who have highly developed independent learning skills, have the capacity to lead the learning process through their questions and ideas and, crucially, are resilient and resourceful enough to get over the many humps along the way. A strong culture of homework in any class or school, is key to developing these skills, particularly in a situation where families are not in a position to provide the necessary platform without a school-led structure. Importantly, homework does not have to mean, literally, ‘work done at home’; fairly obviously, we are talking about any tasks that students do in between lessons – at home, in the library, in the after-school club – whenever, wherever. ‘research shows that homework doesn’t make much difference’. e) the point about homework is to offer learning opportunities and generate a culture of high expectations; half the class will do it and they should not be held back because of the others. 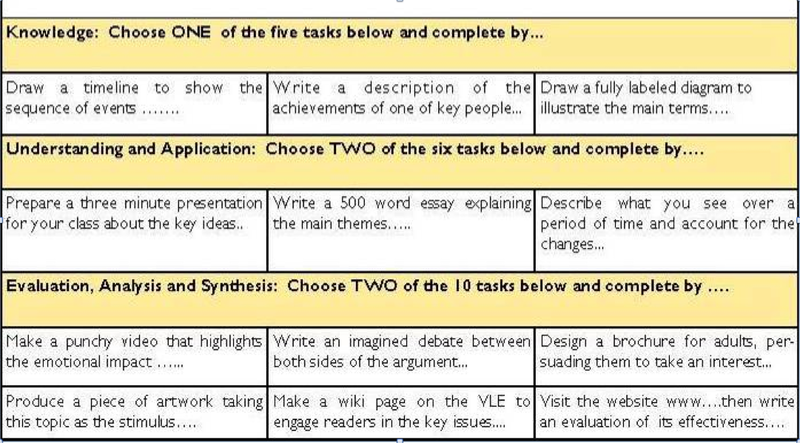 Most homework that I set (as I do religiously, every week for every class) is given on the basis that students will bring it to a lesson in the following week where we will discuss what they have done. 5 or more questions, tackled at home after an initial exploration in class, then form the basis of the next lesson: which questions did we find hard? What different kinds of answers did we get? Then I can help some who are struggling and push others on. This is simply not possible without the homework element. 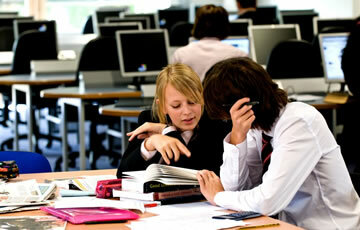 Most homework is, therefore, peer or self assessed. It has to be designed to facilitate that – which is reasonably straightforward. Along with research, note-taking and other pre-learning activities, most homework is about getting ready for the next lesson; this makes lessons much less teacher-centric. There are so many learning processes that do not fit neatly into lesson-long segments. There all kinds of tasks that students prefer to do in their own time, on their own terms – outside the confines of the school day. All students work at their own pace and homework allows them to get to grips with ideas or finish something properly, when they were rushed in class. This applies to writing essays, writing up science investigations, practicing maths problems, constructing a paragraph in French, producing some ideas in a sketchbook for Art or DT…etc. It applies to any number of exam preparation activities. It also applies to some tasks that students would never be set within school time like making videos or designing websites. 3) Creating Opportunities for Creativity and Choice. Homework to my mind is about setting students free to try out different ideas; it is not about drudgery. Giving options for how they present information is a great way to do this: make a video, write a dialogue, write a standard essay or a booklet explaining the idea to younger children. Each of these is challenging in its own way – and students can choose their preferred response. I’ve had some extraordinary work from students with this kind of open ended homework task. The diagram shows a template for a half-term’s worth of homework that would be submitted at different times. How likely is it that Jimmy will have his moment of greatest clarity during the History lesson, period 4 on Tuesday? Or that Sandi will feel at her most creative during Art on Friday after lunch? It is unlikely. I think I made most of my own personal break-throughs in my room at home; the penny won’t drop just because the teacher is there. The goal is to empower students to engage in learning so they can learn anything anytime they want to… and homework is the vehicle for that. Year 13 students don’t just suddenly develop sophisticated independent learning skills; they have to be built up over years – and routine challenging homework throughout Years 7-12 is a good preparation. A good, standard part of homework is to pre-learn material and make notes from books or videos – as with the ‘flipped classroom’ idea and the Khan Academy concept. These things transfer ownership for core learning to students leaving lesson-time free to deal with students’ questions, their difficulties, misconceptions, interesting variations and so on. 5) Reducing the diverging effect of home support: ie it’s about equal opportunities. The research by Hattie et al shows that homes make more difference to learning than schools. So, take away homework and what do we have? Essentially, homes with the greatest cultural capital, typically more affluent and middle class, will just fill the gap with their own family-education as they always have. They’ll be fine. Meanwhile, children from families where home-learning is scarce or simply doesn’t happen are left without structure or resources to fall back on. The same inequalities that give children such different learning orientations from pre-school persist. I’d argue that homework for all is a basic element of an educational entitlement; it is a leveller – provided that schools offer support for ‘homework’ to be done anytime, any place. I think that the quality of homework that comes from a teacher or a school says a lot about the values in that school or classroom. There is a definite link between the teachers regarded as ‘great teachers’ – those who have strongly positive reputations in the school community and model very high expectations – and the extent to which they provide students with a rich diet of challenge in and in between lessons. It is part of the job to involve and engage parents in the learning process; homework is a crucial part of this. As part of the diet of homework, it is lovely to include tasks that explore family history or include parents in some way. Teachers do share the responsibility for promoting their school in the ‘parental choice’ market place and, like it or not, a reputation for being soft or inconsistent on homework can be the kiss of death. This isn’t some superficial ‘pushy parent’ nonsense. I feel the same; taking learning seriously includes taking homework seriously and all the best teachers do! Thanks for writing this post. It has helped me in my efforts to inform the parents of my 10yr old students. Every article and post that supports my Home Learning trial helps. So again, thank you. Great post. Unfortunately all the research point in the other direction. Though of course you knew that… no? Why do teachers just go on hunches and opinions so often? You seem to actively resent facts, research and evidence and just trot out your prejudices. Dear Judge, thanks for your comment. Actually, the research on homework is more subtle and it doesn’t ‘all point in the other direction’ as you suggest. I will post something soon to show this. Hunches and opinions are key in education – education is all about values in the end so we need to be careful not to assume there is some scientific truth about learning that can be pinpointed; that will never happen. I don’t resent facts at all – but after teaching secondary age students for 25 years, the idea that homework is somehow superfluous is laughable to me. Most of my students’ work is done between the lessons; lessons and homework are part of one process.. anyway.. more to follow! Your headings mirror what we are finding schools doing as seen in their submissions for the 3rd Millennium Learning Award (http://www.naace.co.uk/thirdmillenniumlearningaward) – they are developing attitudes to learning amongst the pupils that are considerably raising their energy in learning. And using techniques such as choice and creativity to drive this. I’ve never had any comments or issues reported. It looks the same on most browsers. My theme was the first I tried and it works well. I like the featured image which gives a bit of life to the front page. I find a lot of blogs are dominated by the most recent posting but this theme allows you to feature others quite prominently. If your research is telling you that something self evidently true is not so then you probably need to review your research methods! I could not have achieved the grades I got at A-Level without a huge amount of homework. Almost all of my degree study was homework. Almost all the French vocab I know is due to homework I did 25 years ago. Almost all the English vocab I use is due to books I have read and conversations I have had outside school. I could not have developed my skill in algebra without the practice I did in homework. Surely it must dawn on the people who argue homework has no effect on learning that whatever their precious research says, it’s clearly baloney? It’s a great article, and in many ways I agree with some of his arguments; however, there does seem to be a culture in schools of “this is good so we must do it”, rather than “this is the MOST effective thing to do with the RESOURCES we have available”. We could make the same argument for lesson planning, marking policies, after school clubs, intervention. As for his suggestion that homework doesn’t need to be teacher marked, I investigated this in a piece of action research and found the amount of homeworks completed in a class was proportional to the amount of homeworks marked; in other words, if you want students to complete homework, you need to check they’ve done it and they need to know you will check it. I teach 150 students. Checking homework once a week at 5 minutes a go is 750 minutes or 12 hours. As I asked our Head when he said he wanted to see more marked homeworks in books: what do I stop doing so I can start doing this? Thanks for the comment. You’ve expressed clearly a classic barrier to homework setting. Mainly you seem to be separating homework from classwork too much. When you mark books, you can only give a level of feedback that students can absorb. When I mark, I’m looking across all the recent work including tasks completed at home. It’s all a question of keeping things manageable. There are lots of ways to keep tabs on completion and major learning issues without feeling you need to mark every inch of every homework yourself. Meanwhile, if you do not set routine homework to provide opportunities for extension and consolidation, your credibility suffers… Keep it simple, regular and in perspective. See it as a set of opportunities, and be playful with it; focus on those that do it, not those that don’t. Make hwk feed naturally into lessons, not stuck on the side and separate. Cheers! I will do; however, I think your experience of homework in schools may be a little different from my own! As my action researched showed, if you stop providing meaningful rewards (lollies) or meaningful punishments (detentions), homework doesn’t get done! I’ll try your suggestion your suggestion of marking everything together, and having a bit of peer assessment in class. I did like this phrase: “Homework to my mind is about setting students free to try out different ideas; it is not about drudgery.” Sounds like “Arbeit Macht Frei” to me…! Well, obviously a serious connotation there that misconstrues the genuine spirit of what I’m saying. ! …could be used to describe students in Higher Education as well. Perhaps if students were more adept at independent study during their school years (using the methods you’ve described), they’d see the value of continuing the same practice at university? Perhaps if we renamed it home-learning or pre-learning we might all start to view it in a different way. Homework all too often produces a knee jerk reaction from both parents and teachers who may see it as a stream of worksheets to be completed and marked. As a primary school teacher, children pre-viewing what is going to be taught next, or engaging in an independent, creative home-learning topic has significant value – for the child, the teacher and the parents who can then become more involved with their children’s learning. We introduced this style of home-learning years ago and we have had some amazing projects presented back at school – but we still fight the worksheet battle with many parents who don’t see it as ‘proper’ homework.